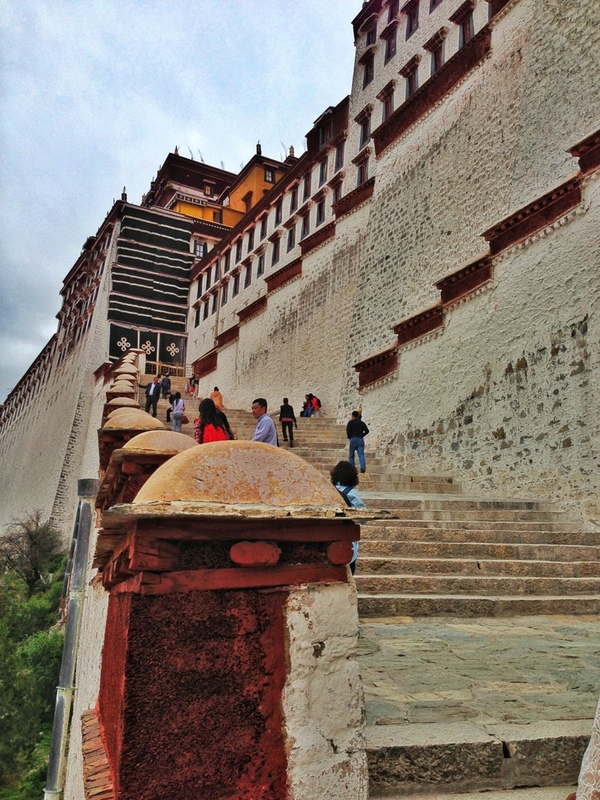 At almost 12,000 feet above sea level, Lhasa is a very high desert. The air is dry and the temperature is mild. 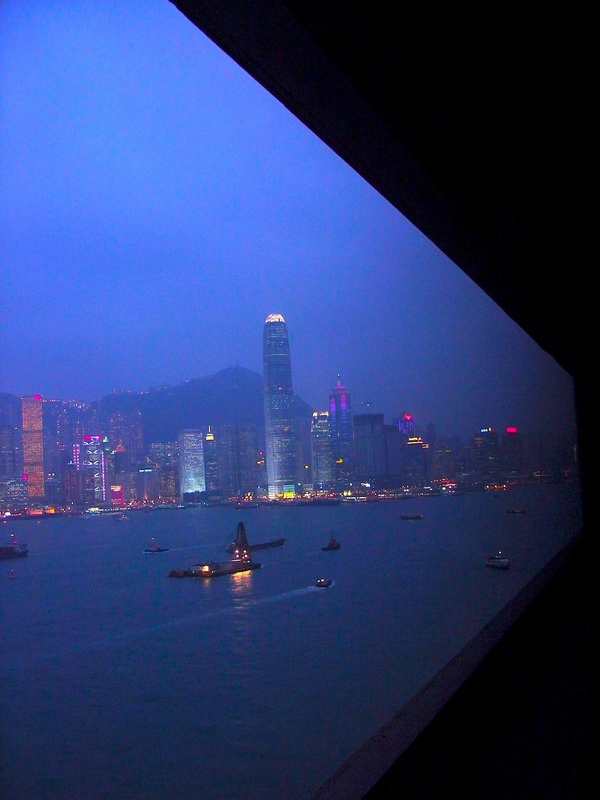 The weather is highly varied, and thunderstorms and blue skies duke it out. For us, the blue skies and puffy clouds won over. Even when overcast, however, the sun’s rays can burn. We saw several lobster-red tourists. Landing is reminiscent of flying into the high desert of Las Vegas, Reno or Jackson Hole. 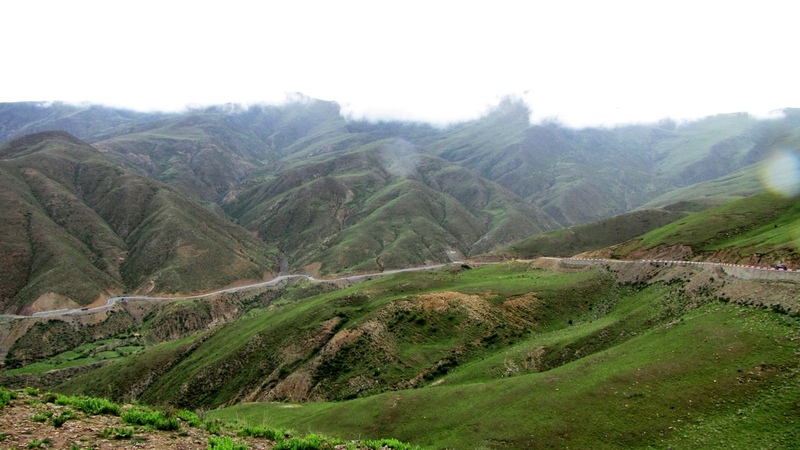 Jagged mountains surround the airport valley with a low river fanning through it flanked by willows and poplar trees. 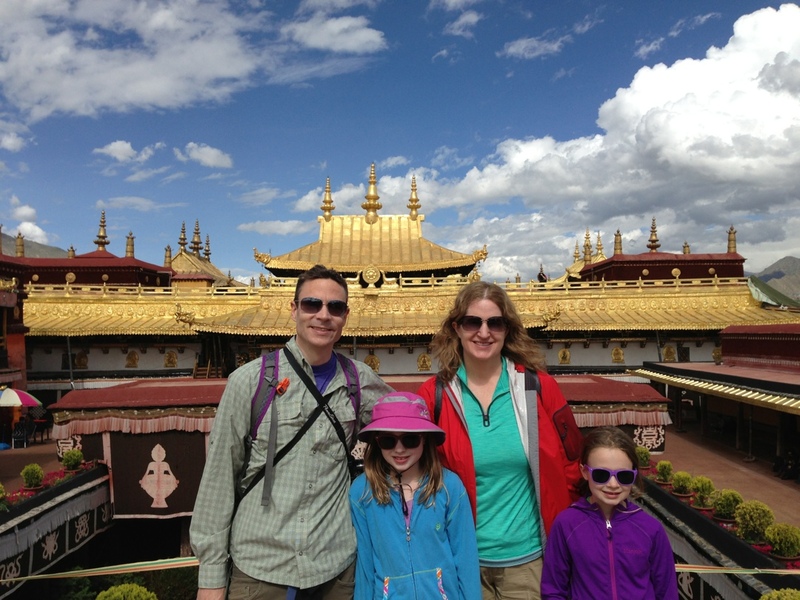 Our guide, Lobsang, met us at the airport, and we headed to Lhasa which is about 60km away. The route takes you through a 2km tunnel that opened in 2005 and reduced the travel time by 90 minutes. 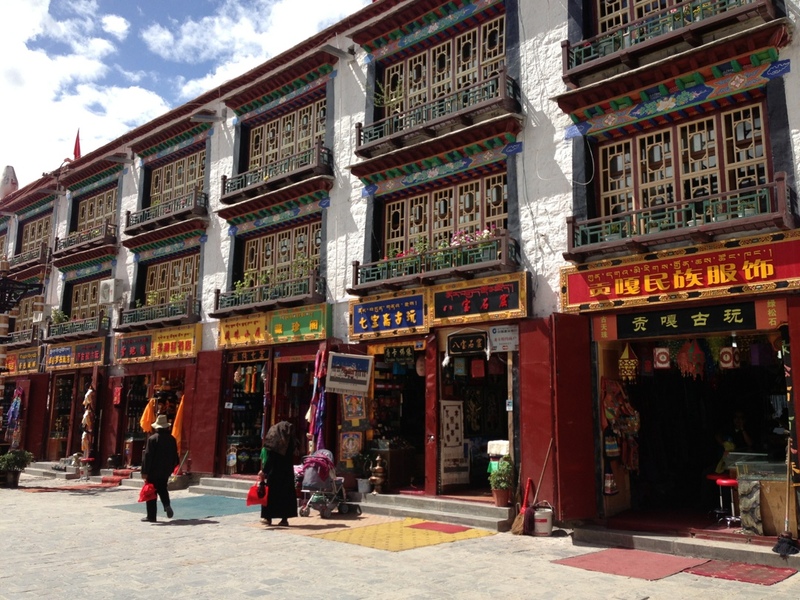 Unlike other Chinese cities, Lhasa seems surprisingly modern. Perhaps because it only has 400,000 people and not millions, it was very small prior to China’s acquisition and didn’t see real development until about 10 years ago. 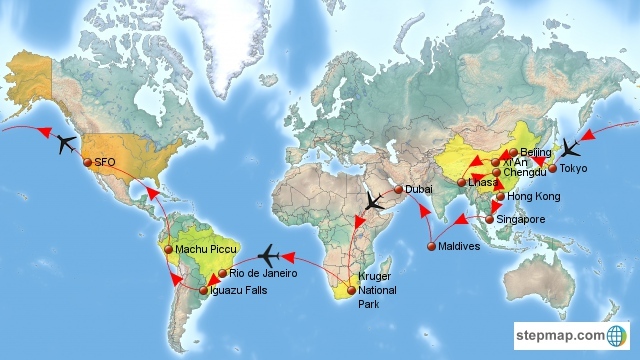 So there wasn’t the massive land area or population to modernize as in Beijing or Xi’An. 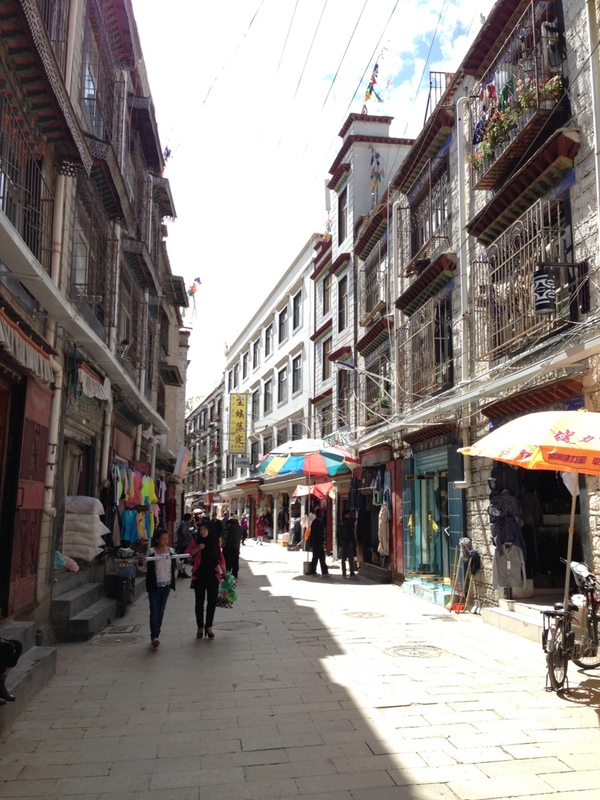 A few major streets paved, some traffic lights, some sidewalks, and voilà: modern Lhasa. 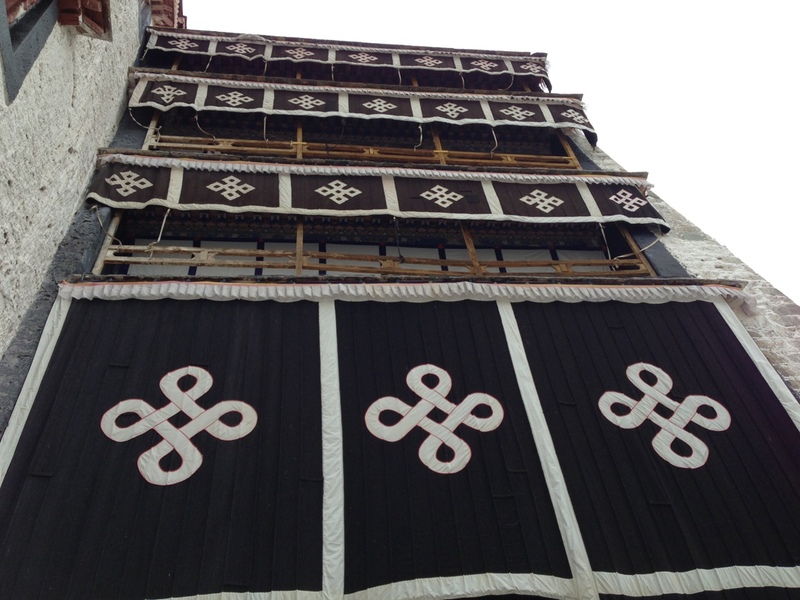 The St. Regis Lhasa is the first 5-star hotel in Lhasa. 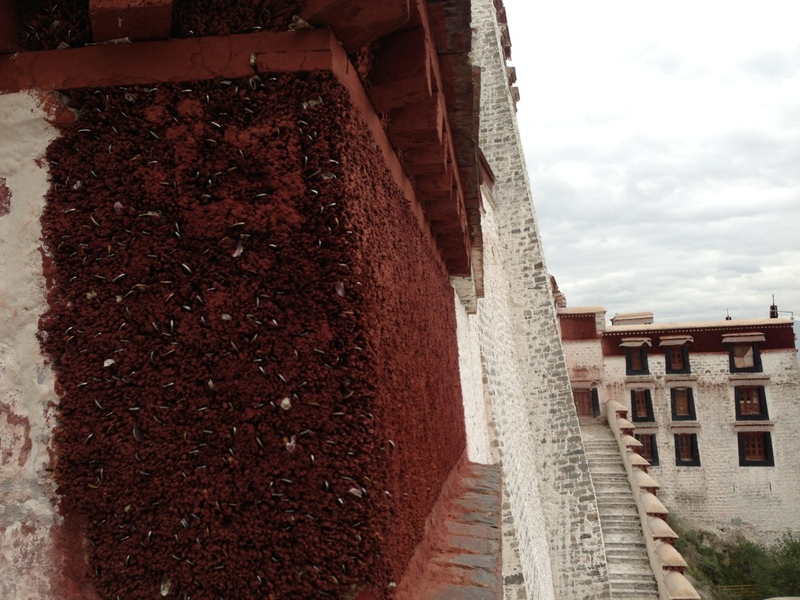 There is a sister Sheraton in Lhasa as well. The St. Regis caters to American, French, Russian, and Chinese tourists (that we saw and heard). It was surprisingly empty for such a large hotel. 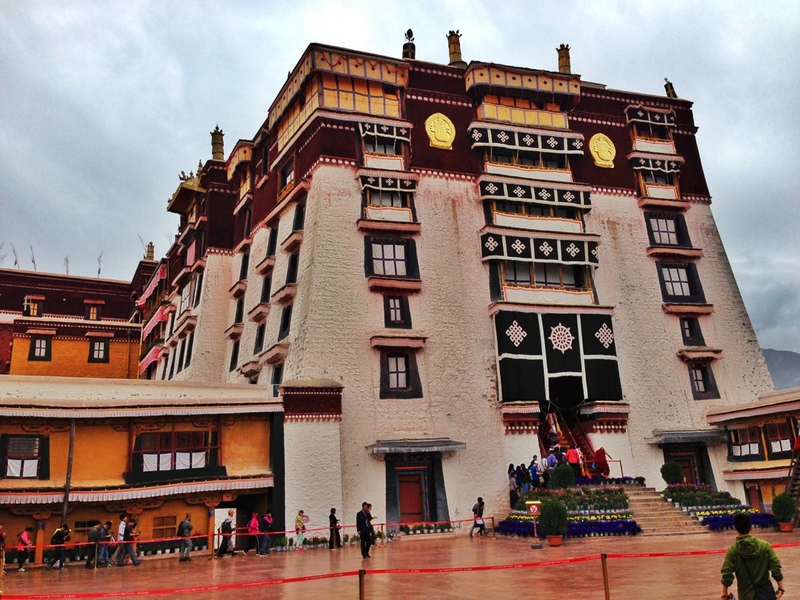 Hotel review and photos in a upcoming post, but the view out the front lobby is of the Potala Palace. Our first night was a little rough. 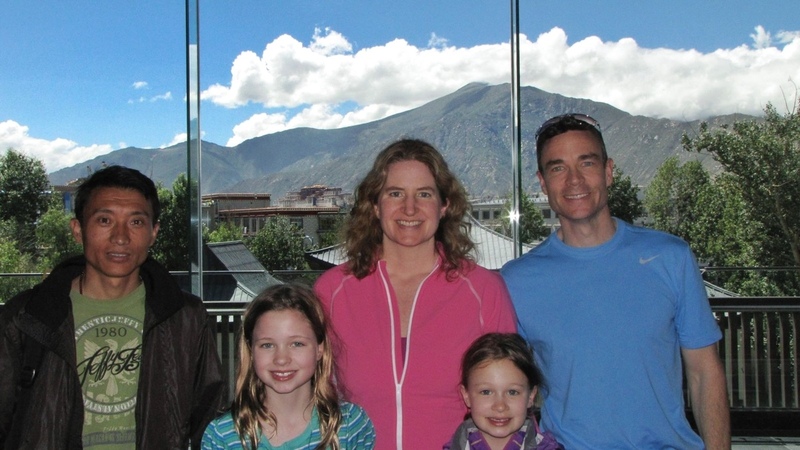 Altitude sickness took hold in the form of headaches and some nausea. By morning, appetites were absent and the headaches had subsided but had not completely disappeared. 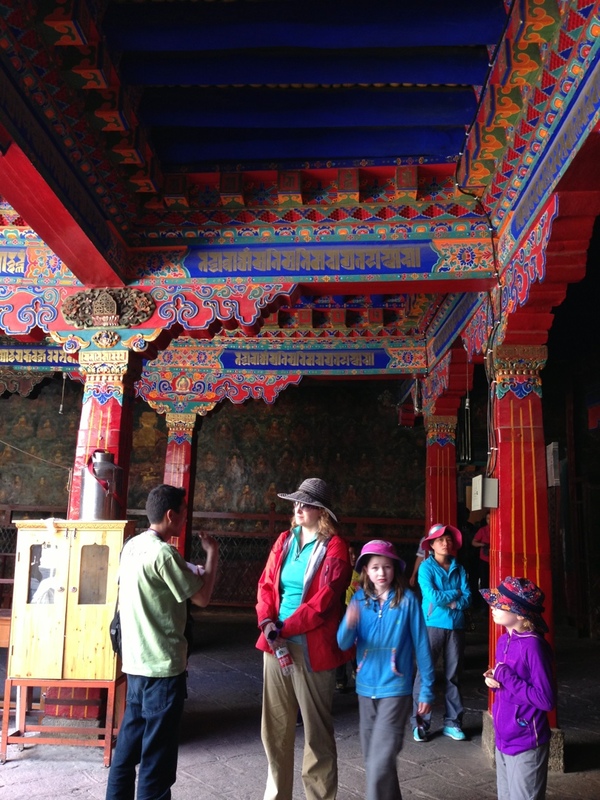 But we met our guide Lobsang in the lobby anyway and headed to the Potala palace, one of the oldest (1300 years old) and largest (1200 ft x 1150 ft x 1000 ft tall) religious buildings. 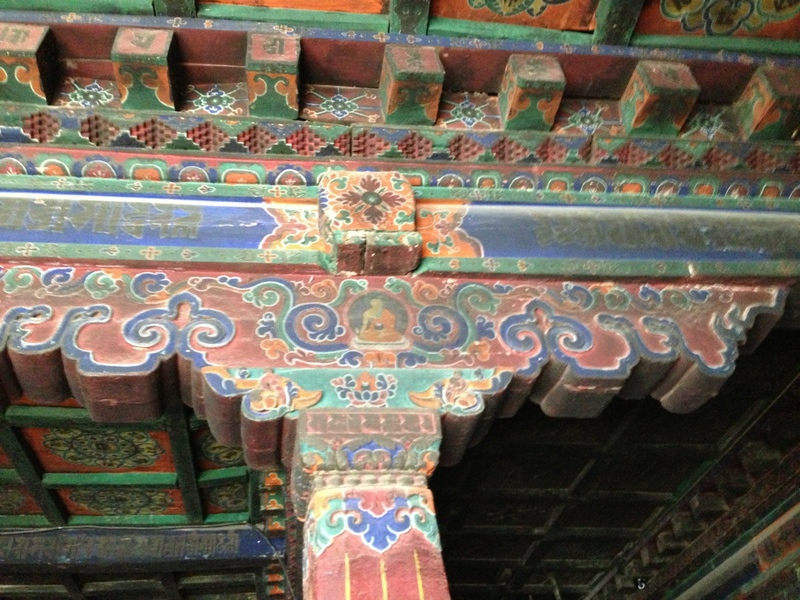 It was also the winter palace of the Dalai Lama until 1959. It was originally built on the site of a cave where Songtsän Gampo (604-650 AD), the founder of the Tibetan Empire, once meditated. The entrance to the palace is several switchbacks up the hill, which is a little slow going at 12,000 feet above sea level! 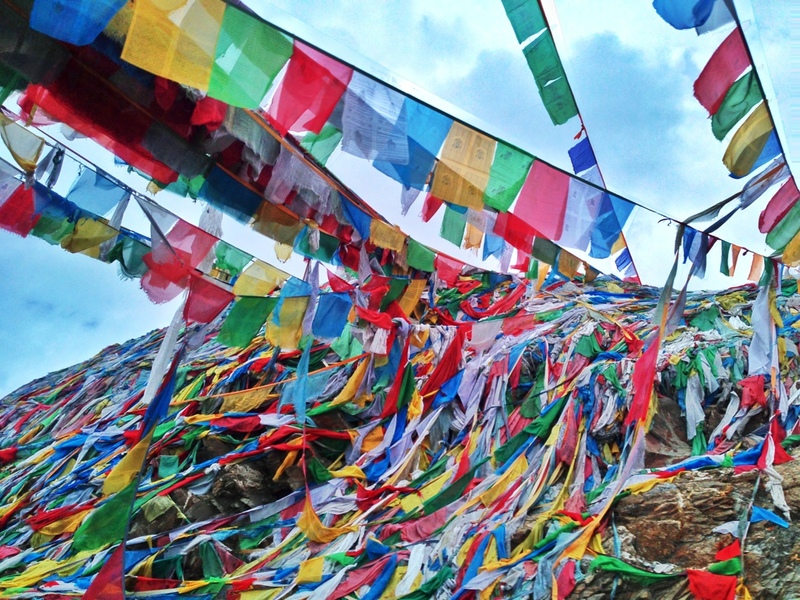 The air in Lhasa is filled with incense as an offering to Buddha. Entry to the Palace has been limited to about 1500 people a day. These large black blankets are made from yak hair. It’s as water proof as a yak! No photos are allowed inside the palace anymore, but we’ll add some links to images found on Google. 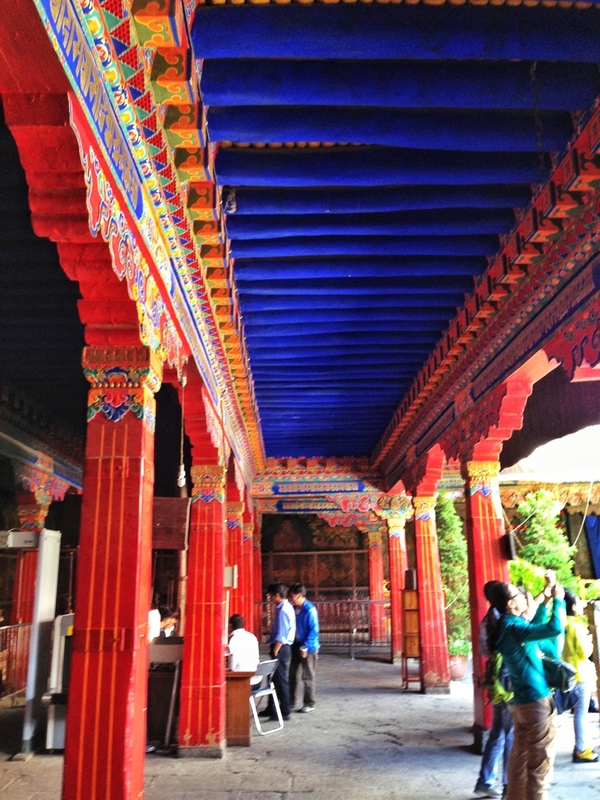 The interior is thick with incense, an offering to Buddha. Each room has large bowls filled with yellow yak butter and a couple dozen wicks burning steadily. Pilgrims drop their own yak butter into these bowls as an offering. Most impressive are the enormous tombs, or stupas, of the 5th (1617-1682), 10th, 12th, and 13th (1876-1933) Dalai Lamas. Some of these tombs are massive at over 70 ft in height and covered with several thousand pounds of gold. 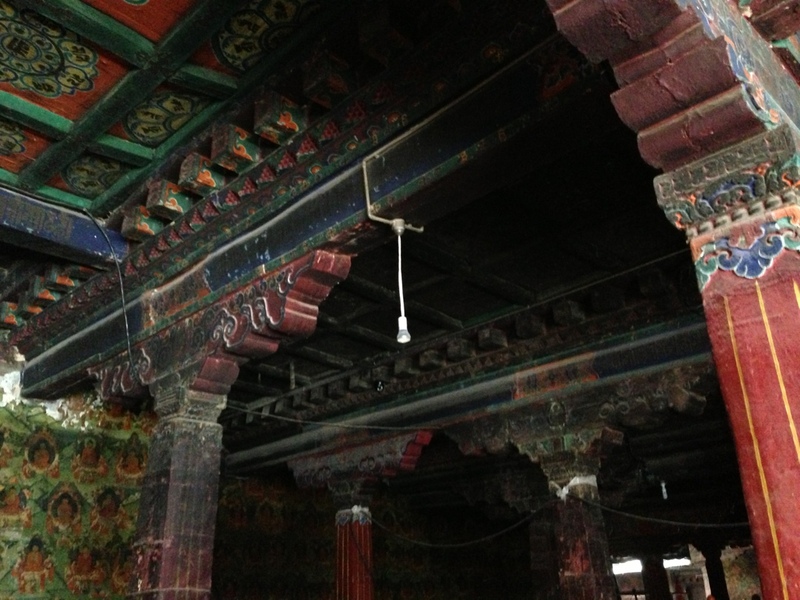 Buddhist writings from the 17th Century fill boxes upon boxes to the ceiling around the tombs. 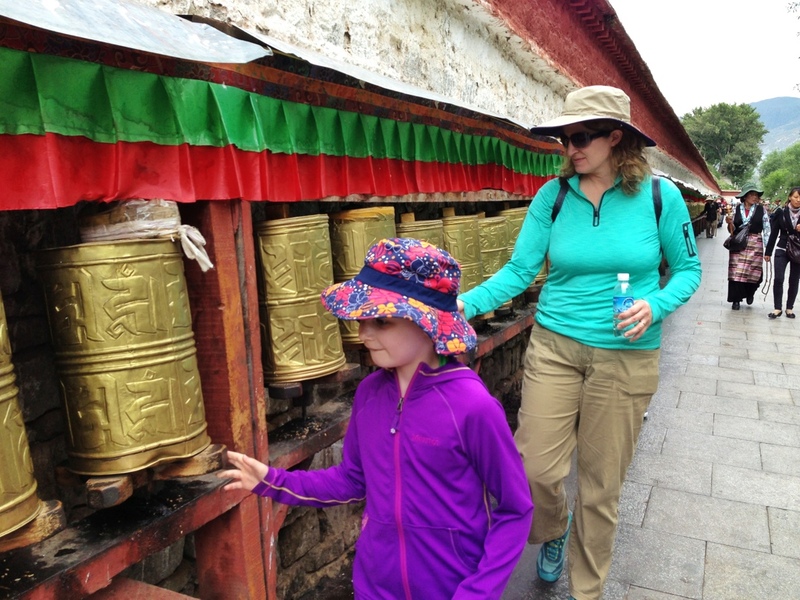 These tombs were built in place by the monks who were master craftsman. 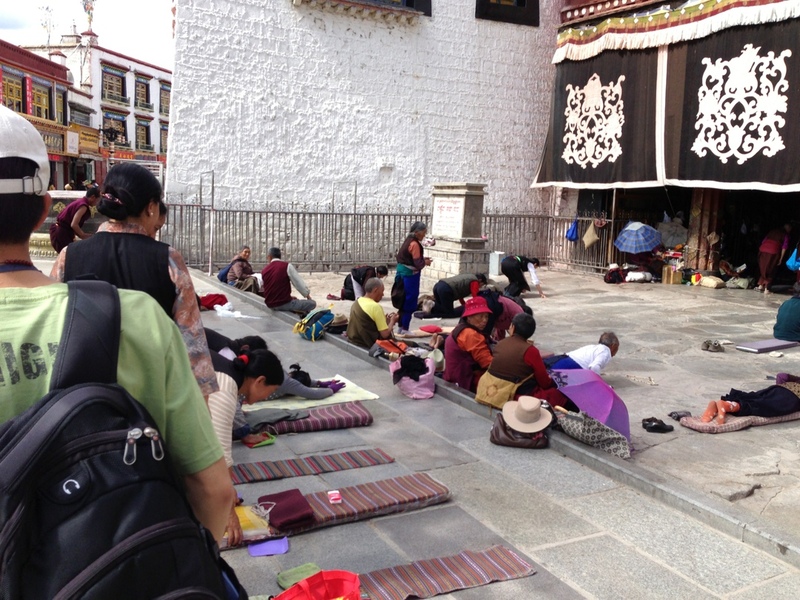 These pilgrims were gathered outside the temple, prostrating hundreds of times. Note the plastic or leather sliding pads on their hands or on the ground (green and purple in this photo) so that they can slide up and back. 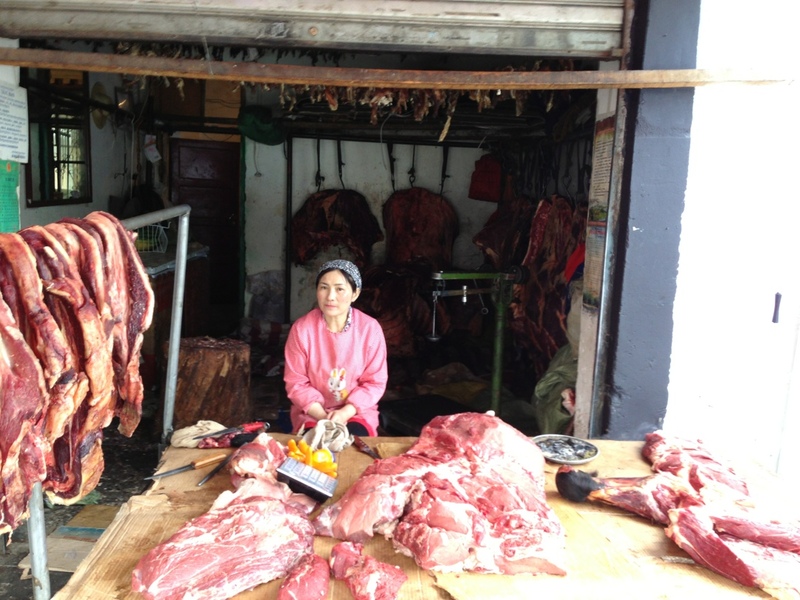 According to Lobsang, the Tibetan people do not cook their yak meat prior to consuming. 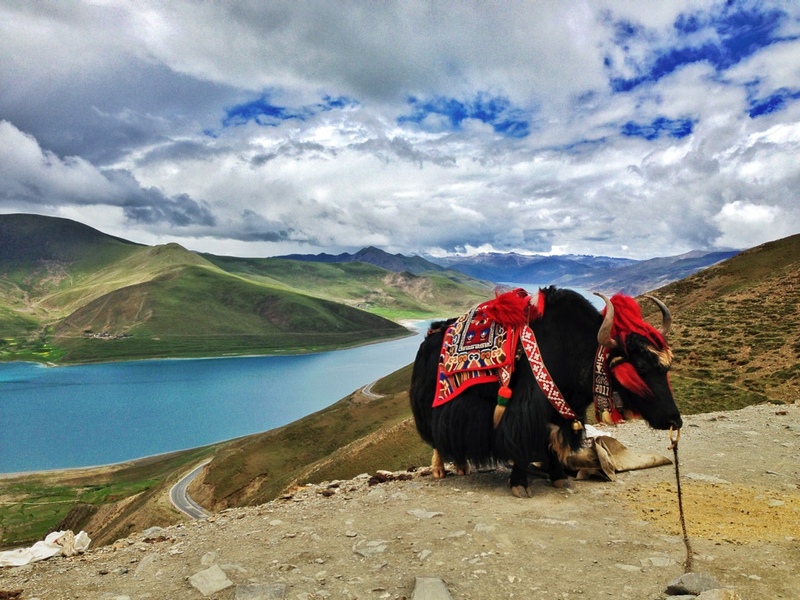 We also noticed a traveler on our flight out of Lhasa who was transporting yak meat in plastic bags as carry-on luggage. 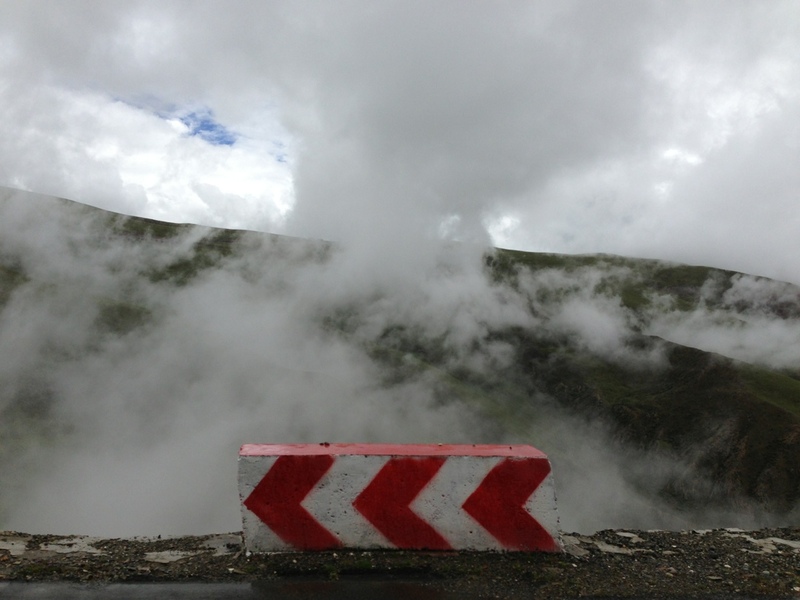 Eventually, we were templed- and incensed-out, so we hopped in the car the next day and headed for higher ground. We drove back south towards the airport before breaking off and heading up a series of switchbacks. 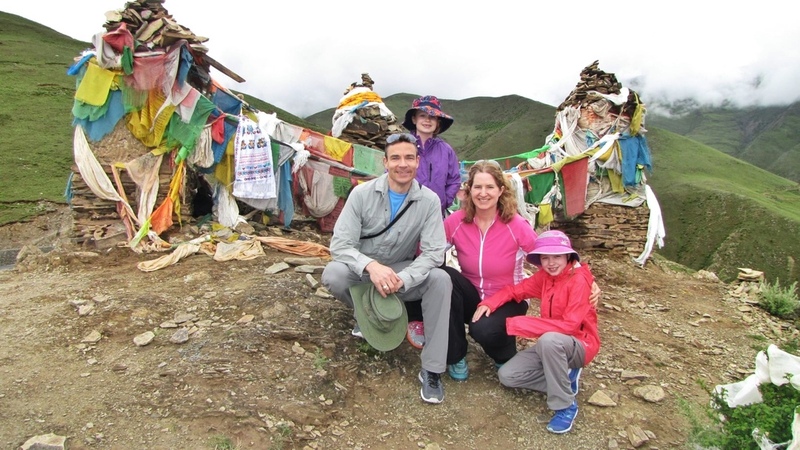 Around 14,000 feet, we stopped at a series of cairns and prayer flags. The colors of the flags symbolize the elements: red =fire, blue=sky, white=clouds, yellow=earth , green=water. 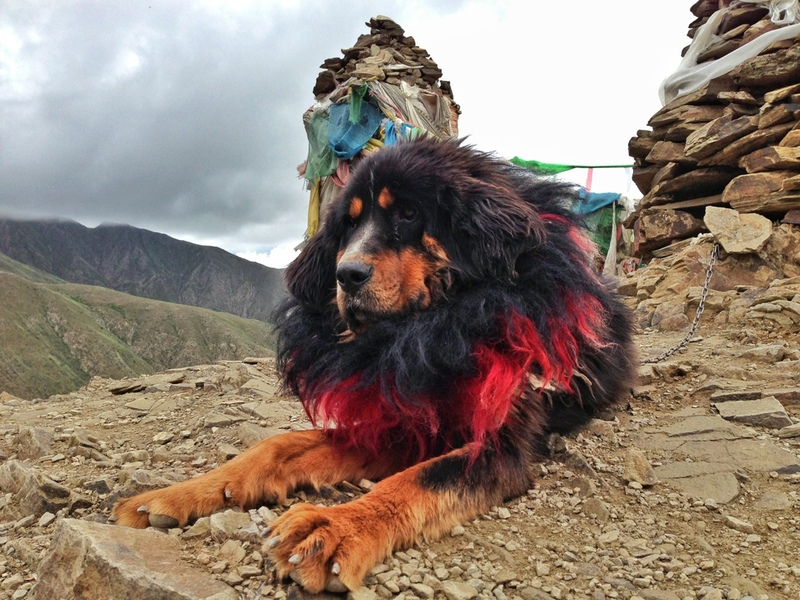 We also met the local mastiff: At about 14,700 feet, we broke above the clouds, and we kept climbing… After crossing over Gambala Pass at almost 16,000 feet (closer to 15,700 according to my GPS), we dropped down to Yamdrok Lake, one of the three sacred freshwater lakes to the Tibetans. This boat is the transportation across the lake to the village on the other side. 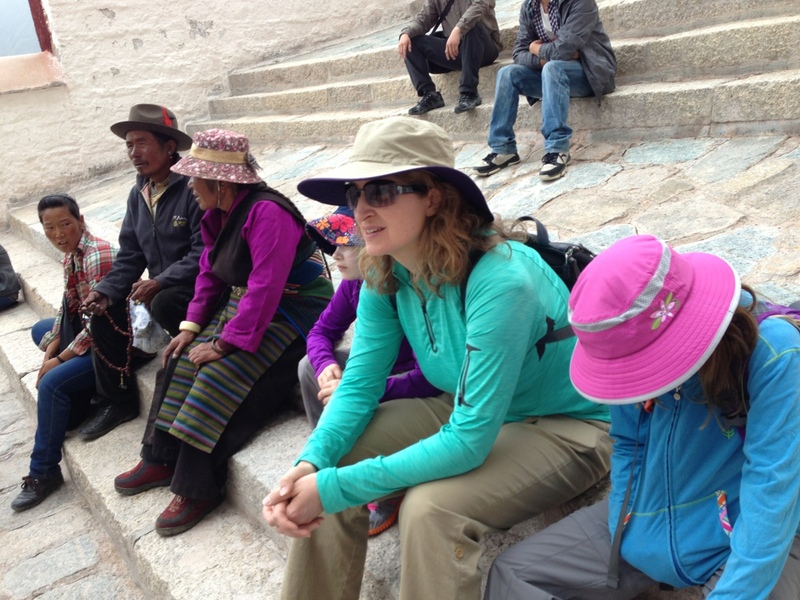 After a visit at the lake, we headed bak up to Gambala pass to visit with the yaks. 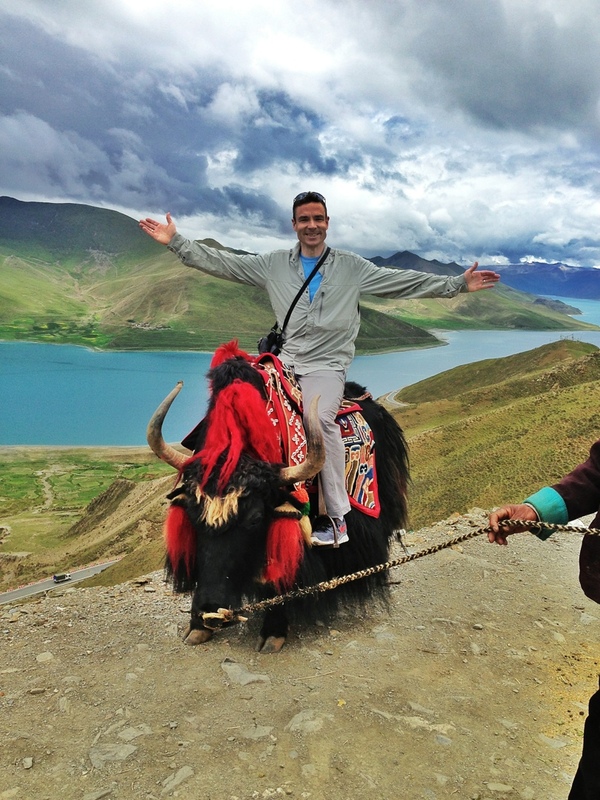 For 10RMB (about $1.50), the kind gentleman let me ride his Yak. 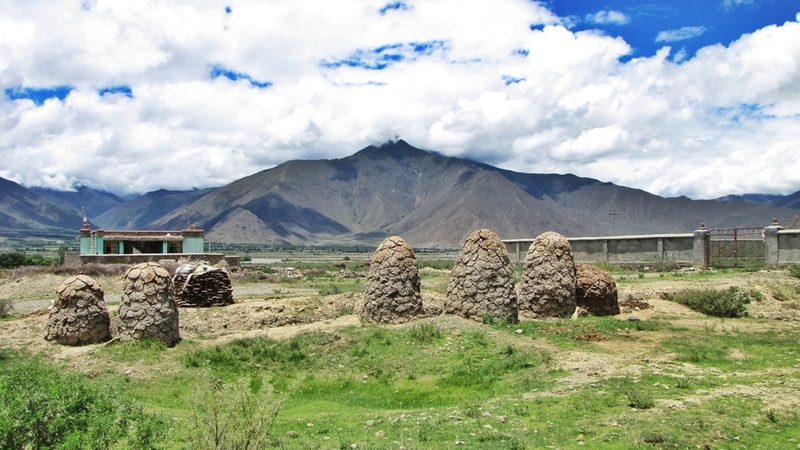 Interesting fact: the locals collect yak dung and dry it in these piles to use as fuel. 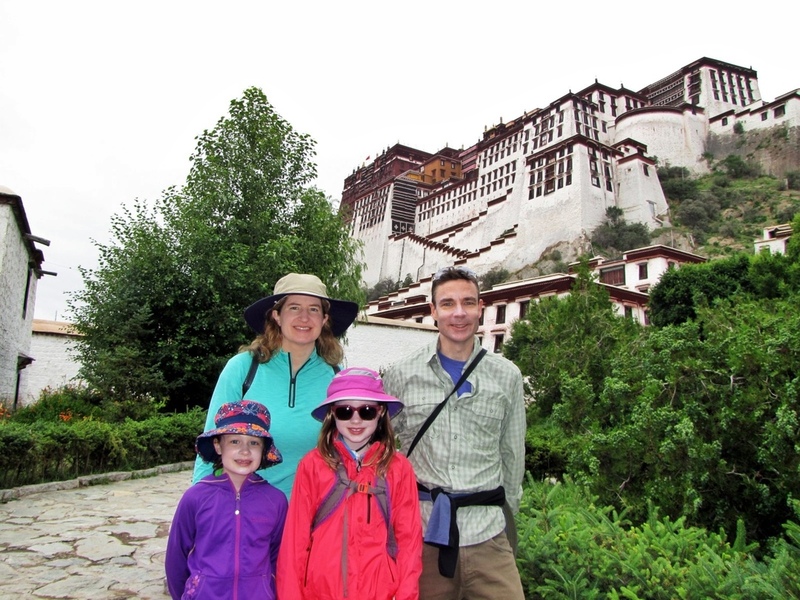 We had a great time with Lobsang in Lhasa (Potala Palace in the background).